What Type of In-Floor Heating Is Right for You? If you've been looking for an effective alternative to forced-air heating, radiant heat may be the answer. But should you opt for an electric or hydronic system? Read on to learn more about the best applications for each type. Spring has arrived at last. But don’t let the warmer weather fool you into forgetting all about the challenges of winter. If your heating system failed to keep you comfortable during the coldest months, things aren’t going to be any different next year—that is, unless you proactively make a change. As you assess your HVAC system, you may very well determine that your frustrations stem from the performance limitations and high operating costs of conventional forced air. Indeed, plenty of people have already reached the same conclusion. That may be why increasing numbers of homeowners are choosing, in one form or another, radiant heating. 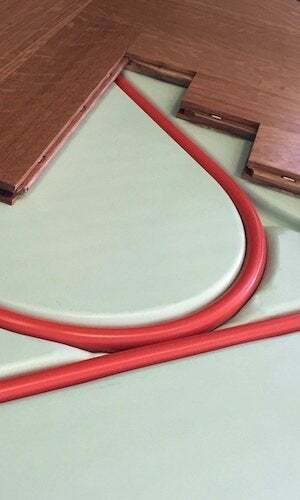 One type of radiant system relies on a network of cables installed between the floor and subfloor. Electricity heats the cables, and the cables, in turn, heat the floor. Electrical systems are ideal for providing supplemental heat in a small room, such as a chilly master bathroom, not least because they are easy to install and incur relatively low up-front costs. Heating an entire house with electric radiant heat would be exorbitantly expensive, though, given that such setups rely completely on electricity, which—needless to say—doesn’t come cheap. For that reason, electric radiant systems can be considered a comfort luxury perfect for heating the floor, but not the home. The other type—hydronic radiant heat—works in a completely different way. By circulating boiler-heated water through tubing below the floor, hydronic systems deliver cost-effective heating for the whole home, and offer a qualitatively different experience than forced air. Whereas forced-air systems heat inconsistently and incompletely, hydronic radiant heat provides encompassing warmth and ensures consistent temperatures from one wall to the other and one room to the next. Ultimately, electric radiant heat succeeds as a supplement, but hydronic competes with and surpasses traditional whole-home systems. Typically, electric radiant systems include three components—heating cables (often woven into plastic mats), a temperature sensor, and a thermostat. Laying the cable can be a do-it-yourself project, as it’s mainly a matter of using thinset to mount the cables on the subfloor. Likewise, the electrical work requires nothing more than basic know-how, but you’re best off hiring an electrician unless you really know what you’re doing. All in all, if you were planning to put in a new floor anyway, perhaps as part of a room remodel, then including an electric radiant mat will probably add just modestly to the overall project budget. Hydronic systems, in contrast, involve a boiler, pump, and fuel lines as well as panels that slot beneath the floor. In other words, hydronic systems are substantially more complex. For that reason, HVAC technicians must be involved from the early planning stage all the way through to final installation. Yet manufacturers are actively engaged in making hydronic systems more accessible. For instance, Warmboard now offers a line of radiant panels specially designed for retrofit applications. Measuring less than an inch thick, these slimmer panels facilitate installation within the confines of any existing residential structure. Electric radiant systems typically operate on a timer. If not, they operate via a thermostat, which causes them to activate whenever the floor temperature reaches or dips below a certain preset minimum. In limited applications, electric systems tend not to run up the energy bill. But if an electric system were installed throughout the home and relied upon as the primary heat source, it would cost a fortune. Put another way, electric radiant systems are affordable so long as they are used as intended, as a means of warming otherwise uncomfortably cold flooring. Hydronic radiant systems, meanwhile, can not only heat the entire home, but do so at least 25 percent more efficiently than forced air. That efficiency is due in large part to the fact that radiant heat involves zero ductwork. Notoriously prone to leakage, forced-air ducts often lose enough heat in transit to compromise a system’s overall efficiency by as much as 50 percent. Because it’s ductless, radiant heat maximizes homeowner savings by minimizing, if not completely eliminating, heat loss. Whether electric or hydronic, radiant heat boasts a number of compelling advantages. For one, in stark contrast with the jet engine-like roar of a forced-air system, radiant heat operates silently. Also, with no in-room vents or bulky, space-hogging ducts, it stays out of the way, invisible, never impeding your decorating scheme. Finally, and perhaps best of all, radiant heat does nothing to diminish indoor air quality. While forced-air ducts collect and then distribute dust throughout the home whenever the system activates, because radiant heat is ductless, it’s also practically dustless, making it particularly appealing to those who suffer from allergies, asthma, or are simply committed to maintaining a healthy home. Although they share much in common, however, electronic and hydronic radiant systems are as different as apples and oranges. Electric radiant heat can be a welcome addition to a room that the primary heating system (for example, forced air) fails to keep comfortable. Hydronic radiant heat, on the other hand, not only matches but surpasses the performance of traditional whole-home installations. The technology has already taken hold in Europe and Asia, and though it hasn’t yet exploded in the United States, it gets more popular with each passing year. There’s a simple reason why: Hydronic radiant heating systems combine high efficiency and unparalleled comfort.